Wow. 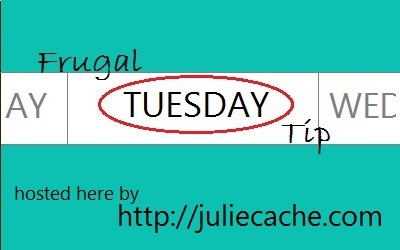 My hostesses and I have learned a lot in the last 36 weeks of Frugal Tuesday Tips. Time flies. As I look at this last week before my book giveaway for The City Homesteader, I think there’s confusion over how to enter. It’s not just for locals. I combined a local meetup ( Oct. 1 from 9:30 – 11 a.m. at Caribou Coffee, 3220 Ingersoll Ave. in Des Moines) with the giveaway. RSVP “no” if you cannot come to the coffee shop in Des Moines but want to win the book. The RSVP will get you entered in the giveaway. RSVP “yes” if you can make it. This will enter you in the giveaway. If you do not win the book, you will still win — by going through the coupons that I won’t use. I saw last week that Sara from Learning the Frugal Life might attend! Deadline for RSVP and/or tweeting and leaving the respective comment is Sept. 29, 2011. On to the frugal tips! The other hostesses and I share our frugal tips with you and invite you to participate here every week. Anything that you do in a frugal way can be included — food, crafts, clothing shopping. Almost everything can be done for less. Adding your blog post to the linky. Your one post will show up on the four hostess websites — juliecache, plus Frugal Playground, Confessions of a Frugal Mind, and Learning the Frugal Life. This entry was posted in frugal family and tagged coupons, frugal tuesday tip, giveaway, meetup. Bookmark the permalink.